Kickstarter Project Funded in 2 Days! I am ecstatic to report that the Runners Kickstarter project has achieved its initial goal of $6000 in just 2 days! That has far exceeded my expectations and I am extremely thankful for everyone who has pledged to date to make that happen. The project still has 28 days to go, so hopefully it will hit its next goal of $8500, which will bring the print job here to the U.S. 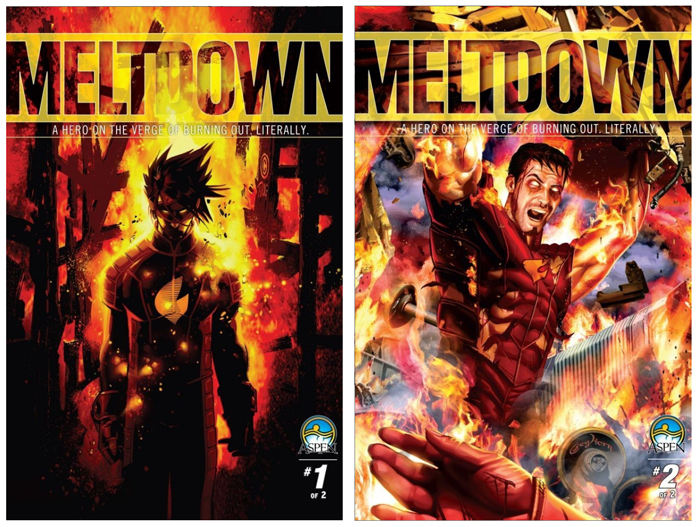 In between the two volumes of Runners: Bad Goods and Runners: The Big Snow Job, I did a side project for Image Comics called Meltdown. It was written by David B. Schwartz, a good friend of mine, and is a fantastic story about a superhero whose fire-based powers are killing him. As his powers slowly build beyond his ability to control, he starts to re-evaluate his life and what he wants to do with it before the end. Does he finally take down his arch-nemesis? Does he try to reconcile with his ex-wife? Or does he try to change the world in some small but significant way? Personally, I would eat chicken wings and play board games, but then that’s why I’m not a super-hero. I had a great time working with David on the project and especially had a blast doing the art, which traverses a number of styles depending on the era of the hero’s life: his more innocent, childhood days are done in a lighter, cartoonier style, which gradually devolves into a darker and grittier style as the story progresses. Fun! Both 48-page issues are now published by Aspen and available digitally through Comixology for just $2.99 each. I highly recommend them! Plus, covers by Chris Bachalo and Greg Horn! And you’ll also want to check out David B. Schwartz’s new series, Idolized, the story of girl with super-powers and a dark past, who seeks revenge, and ultimately finds redemption, over the course of competing in a TV super-hero competition reality show. It’s a great concept with really nice artwork by Micah Gunnell!